Synopsis: The adventures of Gustave H, a legendary concierge at a famous European hotel between the wars, and Zero Moustafa, the lobby boy who becomes his most trusted friend. Review: In the interest of total transparency, I wanted to let you know that I’m not a dyed in the wool devotee of Wes Anderson. Sure, I devoured The Royal Tenenbaums as fast as the next art house hound but I started to have my doubts with The Life Aquatic with Steve Zissou and, full disclosure, didn’t even bother with The Darjeeling Limited. Meryl Streep got me back to Anderson providing a voice for the clever clever clever The Fantastic Mr. Fox and my journey was complete with 2012’s Moonrise Kingdom, one of my top films of that year. It’s March now but I saw The Grand Budapest Hotel in February and knew even then that another Anderson film would be near the top of my list for 2014 because this film represents the filmmaker at his most imaginative, most focused, most comedic, and most free from the convention and chumminess that I felt stymied some if not all of his pre Moonrise Kingdom works. Here’s a director with that rarest of rare gifts…a point of view. You don’t even need to know this is a Wes Anderson film to know it’s a Wes Anderson film. His use of color and his attention to symmetric detail demonstrates a skill very few directors possess and Anderson continues to lead the way. It says something that in Hollywood’s copy happy climate I can’t recall another studio or director that has even attempted the kind of precision and whimsy Anderson makes look effortless. His new adventure (and it’s truly an adventure) takes place in three different time periods (and, if your theater is heeding the filmmakers instructions, three different aspect ratios) and charts the goings on of the titular lodging and it’s charismatic concierge that made it famous Inspired by the writings of Austrian Stefan Zweig, Anderson’s film has a little bit of everything from campy farce to murder mystery foibles. Behind every door of the hotel could lie danger or a lusty encounter with lord knows who. Priding himself on his exceptional service in and out of the bedroom, randy would-be sophisticate concierge Gustave H (an inspired Ralph Fiennes, Skyfall) mentors young lobby boy Zero Moustafa (perfectly etched by Tony Revolori in the past and F. Murrary Abrahm in the almost present) in the ways of love and lodge, eventually embroiling him in a family squabble after a rich old lady (a marvelously brief cameo by Tilda Swinton, We Need to Talk About Kevin) kicks the bucket under suspicious circumstances and leaves a prized painting to the concierge that warmed her bed. Chock full of familiar Anderson players, some are seen briefly while others have meatier roles that allow them to go all out. All are standouts but notables are Adrien Brody (The Pianist) as Swinton’s son wanting his just reward, Willem Dafoe (Out of the Furnace) drawing on his Shadow the Vampire character to play a ghoulish thug, Jeff Goldblum (Jurassic Park, The Big Chill) odd as ever as a family lawyer, Jude Law (Side Effects) as a curious writer, Edward Norton (Moonrise Kingdom) turning up as a detective while Saoirse Ronan (How I Live Now, The Host), Jason Schwartzman (Saving Mr. Banks), Tom Wilkinson (The Lone Ranger), Owen Wilson (The Internship), and of course Bill Murray (The Monuments Men) pop up when you least expect them to. No big surprise that Anderson’s film is given the grandest of grand production designs courtesy of production designer Adam Stockhausen (Oscar nominated in 2013 for 12 Years a Slave), art directors Stephen O. Gessler (Cloud Atlas), Gerald Sullivan (The Dark Knight Rises), & Steve Summersgill, set decorator Anna Pinnock (Life of Pi), and three time Oscar-winning costume designer Milena Canonero (Carnage). Frequent collaborator Alexandre Desplat composes a typically tonally perfect score that sets the mood with style. Count on all to be recognized with Oscar nominations a little less than a year from now. Hopefully, Anderson, Fiennes, and the picture itself aren’t too distant of a memory when the award nominations are announced at the end of the year. It would have been so easy for Anderson to toss this jewel of a picture into the 2013 award race but I think it was a wise choice for Fox Searchlight to hold this one back a bit and let audiences come down from their American Hustle and Gravity highs to start their new season off with a bang. 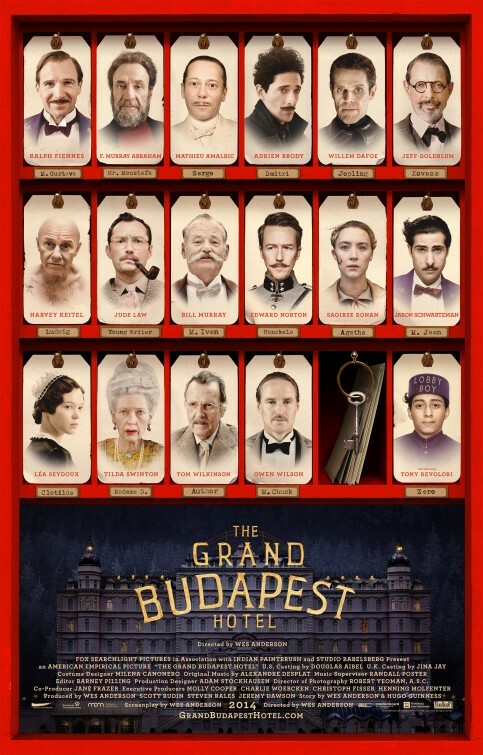 A film of numerous superlatives, The Grand Budapest Hotel is, for my money, Wes Anderson’s finest film to date. Energetic, often hysterically funny, and excellent from the first frame to the last it’s as close to a perfect film experience as I’ve had in some time. For some, it may be too left of center to feel the same way but I was bowled over with little reservation. Got something you think I should see? Tweet me, or like me and I shall do my best to oblige!